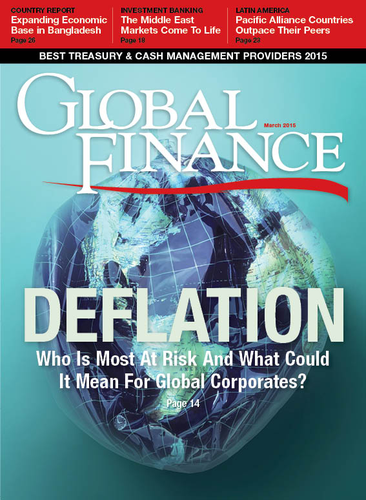 Deflation: What It Means For Global Economies & CorporatesWhat's So Bad About Deflation?Who's Most At Risk? When the European Central Bank (ECB) announced its version of quantitative easing on January 21, the decision to buy €60 billion ($68 billion) a month in eurozone bonds came only days after prices in the region had slid for the first time in five years, raising the specter of a deflationary spiral. Markets around the world reacted strongly. Not only does the eurozone account for 40% of global GDP, but to some extent the region’s problems reflect similar ones in much of the rest of the world. The appearance of price deflation in the eurozone and elsewhere has followed years of weak inflation in the wake of the financial crisis. In the eurozone itself, prices have risen at a rate well below the ECB’s annual target of 2% despite its efforts, however half-hearted, to spur economic growth. Quantitative easing [QE] may or may not be aimed directly at preventing deflation from taking hold in the eurozone. But ECB president Mario Draghi and other policymakers clearly hope it will have that effect. The reason has to do with deflation’s pernicious effect on economic activity [see sidebar, page 18]. Japan, to be sure, has been experiencing a mild form of deflation for two decades and hasn’t descended into depression. But the country has been moving sideways economically for most if not all of that period. And China has in the interval eclipsed it as Asia’s most important economy. But China is also slowing, dragging down much of the developing world and leaving the United States as the global economy’s sole growth engine, at least at the moment, a situation that International Monetary Fund managing director Christine Lagarde recently described as “lopsided” and perhaps unsustainable. After all, the dollar’s heady rise in recent weeks threatens to dampen US growth as well. From that perspective, quantitative easing by the ECB is simply the most dramatic example of a deflationary downdraft reflecting weak demand across the globe, and the recent plunge in commodity prices reflects that trend to some extent. As a recent report by HSBC put it, “Deflationary pressures were well established long before oil and other commodity prices fell, suggesting that the world economy remains in relatively poor shape.” The rest of the world is keenly watching Draghi’s efforts. Can he keep the region from sliding deeper into reverse? The jury is still out, and opinion about the potential effectiveness of the ECB’s asset-buying program is sharply divided. The size of the bond-buying program announced by Draghi exceeded investors’ expectations and impressed many observers. Fergus McCormick, head of sovereign ratings for DBRS, a credit rating service based in Toronto, says Draghi’s move was dramatic. “It will help trust and confidence,” says McCormick, noting that the absence of confidence has been at least partly responsible for “chronic low demand” in the eurozone. Tom Elliott, international investment strategist for advisory firm deVere Group, says the bond-buying program amounts to “a pretty hefty dose of medicine” for the eurozone. But can monetary policy do much at this point to spur weak demand? After all, deflation in the eurozone stems from a lack of spending and is essentially a deeper version of the weak inflation that has been apparent there and in other developed-world economies for years. The transmission channels [for monetary stimulus] are broken. We’ve been trying to solve a fiscal problem with monetary instruments. Indeed, inflation has been running below not only the ECB’s target but also that of the Federal Reserve and other central banks. And with interest rates at zero, there may be little more central banks can do to stimulate demand, since the private sector is more interested in paying down existing debt than adding more to its balance sheets. Meanwhile, governments elsewhere are politically inhibited from spending money on infrastructure, research or other public projects that could offset the dearth of private spending and thereby boost demand.